According to Cosmas, the earliest Bohemian chronicler, the legendary seer, Libuse, stood on the rocky spur overlooking the river Vltava and prophesied that on the banks of that river would stand a city whose fame would reach the stars. 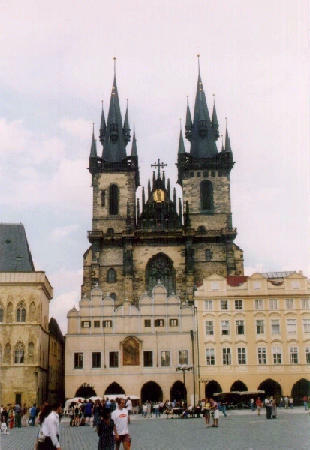 The name of this city was to be Praha – or Prague – the capital of the Lands of the Czech Crown. Given that Prague welcomed about sixty million visitors in 1994-5 and that the city has become a ‘must’on most European tourist itineraries, it could be postulated that Libuse’s prophecy has been fulfilled. Prague is the capital city of three regions called Bohemia (Cechy), Moravia (Morava) and a part of Silesia (Slezko) which since 1993 have been called the Czech Republic. The historic core of the city is situated on and between two large, rocky spurs on either side of a bend in the Vltava River. On the north-western spur (that is, on the left bank of the Vltava) is found Prague Castle with the cathedral of St Vitus. These dominate the city skyline and can be seen from virtually every location in Prague. Before 1784, when the city of Prague became a single entity, the city was organised into four autonomous areas. Although there is now no man made barrier between these areas, they still exist as specific precincts of Prague. 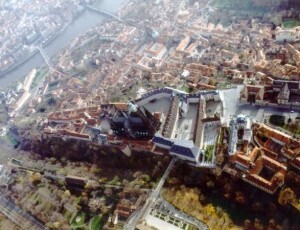 Thus, on the left bank, sharing the upper part of the spur with the castle and its cathedral, is the area called Hradcany. Just below the castle, in a broad sweep towards the Vltava, is the Lesser Town (Malá Strana). Across the river on the eastern bank is Prague Old Town (Staré Mesto). These three areas sprang up in the Middle Ages without any specific urban planning. The fourth region, Prague New Town (Nové Mesto), on the other hand, which stretches alongside Prague old town towards the south-eastern spur of Vysehrad, was the result of deliberate planning by Emperor Charles IV in the fourteenth century. Although it is divided into four sections, the central city is compact and easy to navigate, being dominated by such distinctive monuments as the Tyn Church, with its distinctive Gothic spires, the Town Hall, the Clementinum, the Lesser Town Lower Square and Upper Square (divided by the church of St Nicholas), and the Castle and cathedral. These monuments signify ‘nodal points’in the city which are of historic significance as well as physical importance to the city. allows the visitor to experience a city largely unaffected by the architectural incursions of the post-war period. The modern visitor to old Prague still walks the same streets as the renowned Protestant revolutionary of the early fifteenth century, Jan Hus, and sees much the same streetscapes as Mozart would have viewed during his visit to the city in the eighteenth century. Prague is also an excellent city for those who are interested in the historical development of one of the most interesting parts of Central Europe. Because the lands which make up the Czech Republic are geographically positioned in the very heart of Europe, from early times they were open to almost every major European influence from both East and West. Due to this small country’s strategic position and wealth in the Medieval period (Kutnåa Hora silver mines) the Czech lands were coveted not only by the Bohemian Premyslid dynasty but also by foreign rulers from lands such as Germany, Poland, Hungary, Luxembourg and Austria. Through a study of the city’s architecture and artefacts, it is possible to observe the impact of virtually every major historical period not only in Czech lands but in Central Europe as well. Thus, the discerning traveller can vicariously experience the lustre of Emperor Charles IV’s Gothic Prague as the fourteenth century capital of the Holy Roman Empire, the iconoclastic effects of the fifteenth century Hussite Protestant revolt, the impact of Renaissance ideas during the extraordinary reigns of Ferdinand I and Emperor Rudolf II, the influence of the Counter-Reformation under the Hapsburg dynasty’s rule (which resulted in a great flowering of Baroque churches and palaces), the monumental expressions of ardent nationalism after 1848, the languid and romantic impact of Art Nouveau in fin de siècle Prague and finally, in Prague New Town, the effects of twentieth century ideas reflected by cubist and ‘social realist’ principles. Perhaps it is the small scale, compactness, and visual unity of the city which entrances even those who are not concerned with the history of its monuments. What could be more delightful than to indulge in a local version of the Venetian far niente and randomly wander through the many parks or gardens, the streets of the old city and be enchanted by the ever changing ambience of narrow, cobbled, twisting roads, by small, crumbling squares, by the endless colorful facades of burghers’ houses, or by breathtaking views of what seem to be hundreds of spires and domes? When weariness overcomes even the most enthusiastic walker, there are always opportunities to sit and drink a coffee or large glass of the renowned Plzenské pivo (pilsner beer) in an open air cafe and observe the changing mood of the streets or squares created by the mysterious play of light and shadow on the facades of the buildings. ‘Ambience’ is a function of the perception of space and form and Prague’s spaces create a perfect setting for its absorption. The night also brings a special enchantment and excitement to the city and no visitor should leave Prague without at least one excursion after dark. The most important of the streets are well lighted and the significant squares and monuments are now bathed in spot lighting which gives Prague a fairy tale atmosphere, an effect remarked upon by a number of authors. The streets are enlivened with Praguers and visitors hurrying to some church, palace or concert venue to hear a musical performance. As one of the great musical centers of Europe, Prague has a long and important musical tradition (Stamitz, Dvorák, Smetana, Janácek, Martinu) which is fostered and cherished by the local citizens. Therefore, on most nights of the week, innumerable concerts of classical music are offered, often in beautiful historic venues. The musical developments of the twentieth century, however, are not neglected, as may be witnessed by the many bars and restaurants which resound to the music of jazz bands or folk groups, while buskers and other performers entertain the pedestrians in the streets. This gives credence to the old Czech saying, ‘every Czech is a musician’.